After recently and repeatedly trying the coconut soup at Vientiane Lao-Thai cafe in West Philly, I determined I needed to try my hand in making something similar at home lest the restaurant run out of it on my accord. 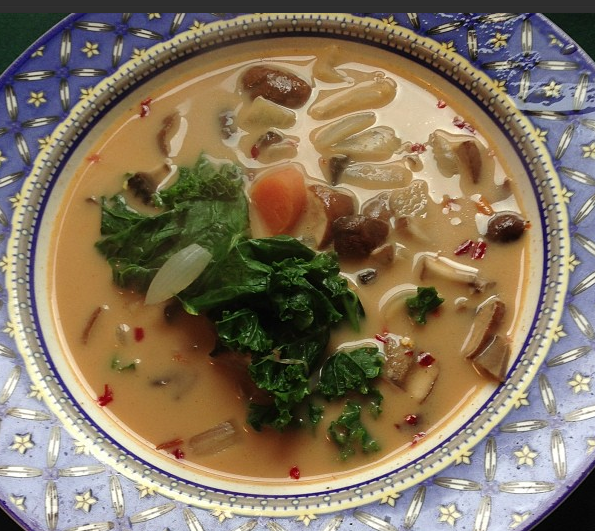 After picking up a can of light coconut milk from Mariposa Food Co-Op and fistfuls of local kale and 1/2 pound crimini and portobello mushrooms at the Clark Park Farmers’ market, I set to fashioning my version of veggie-filled soup. The just-blanched crunch of the kale, which I tossed in at the last moment, was delicious paired with the chickpea miso-infused mushrooms, garlic and onions. Paprika is optional, but I loved how it changed the tint of the soup and added smoky flavor notes. This soup honestly does stray from the Vientiane version, and is undoubtedly missing “key” ingredients, but I still think it’s good enough to stand on its own and I entreat you to make it! Chop all produce ingredients. Cook the mushrooms, onions, and garlic in coconut milk, coconut oil and chickpea miso, paprika and red pepper flakes (if using), adding a little bit of water if needed. After 15 minutes on the stovetop, add in the carrots and cook another 3-4 minutes (I like crunchier carrots–feel free to cook longer). Toss in the kale right before serving. Enjoy! Yum to the max! You culinary genius you! winter is approaching…soup time is comin’. and this looks gooood! on September 30, 2013 at 5:49 pm | Reply Sarah E.